Tonight, Gov. 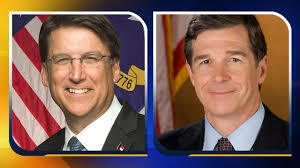 Pat McCrory will defend his record in his first televised debate with Attorney General Roy Cooper. The debate will be moderated by Chuck Todd of NBC and will air live between 7 and 8 p.m. on UNC-TV. This morning, residents whose water has been contaminated by coal ash chemicals will join local environmental groups outside UNC-TV studios to urge moderator Todd to ask McCrory about his administration’s ongoing cleanup coverup of coal ash pollution across the state, and his relationship with his former employer, Duke Energy. Secret Dinner: At the height of the coal ash cleanup debate in 2015, McCrory held a secret dinner meeting at his mansion with Duke Energy executives and state environmental regulators. Shortly afterward, the McCrory administration reduced Duke Energy’s coal ash fine from $25 million to $6 million. What agreements were made during your secret dinner meeting? Rudo Meeting: McCrory's chief of staff held a last-minute press conference in the dead of night to accuse state toxicologist Dr. Ken Rudo of lying under oath after he testified that McCrory participated in a meeting between Dr. Rudo and McCrory's communications director to discuss water safety standards. Now McCrory's chief of staff admits that the governor did in fact call into the meeting. What did you discuss? Why did you allow your chief of staff to falsely accuse a 30-year state scientist of lying under oath? Water Standards: McCrory characterized his attempts to pressure state scientists to weaken water safety standards and cancel hundreds of Do Not Drink orders as a "disagreement among scientists." But not a single state scientist has gone on record agreeing with that position, and state epidemiologist Dr. Megan Davies even resigned over the administration's attempts to mislead the public. So which "scientists" are you talking about? Do they perhaps work for Duke Energy? Coal Ash Families: Why did McCrory have dinner with a big corporate polluter which has donated thousands of dollars to his campaign but won't take time to visit any of the hundreds of families who have struggled for over 18 months with contaminated water? Why are you more interested in protecting the corporate interests of Duke Energy than the health and safety of North Carolina families? Cleanup Costs: Why did McCrory sign a law allowing Duke Energy to pass the costs of coal ash cleanup on to rate-payers? Why should North Carolina families be forced to pay to clean up Duke Energy's mess? Can we just all agree how screwed up this guy is. Take for instance the number of citizens who have lost their lives in the floods because the money to repair infrastructures, like levees, was used to fight HB2.